Old Prague Hostel i Prag, Tjeckien : Boka nu! 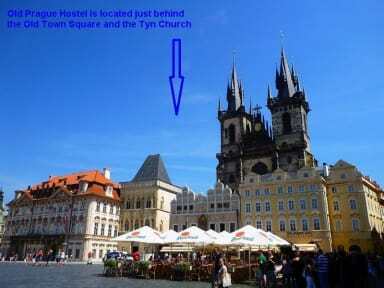 WHY stay OUT of the center when at the same price you can stay at the famous ASTRONOMICAL CLOCK?!! WHY SPEND MONEY FOR PUBLIC TRANSPORT?! Our newly reconstructed Prague hostel is located DIRECTLY in the HISTORICAL CITY CENTER in the centre of entertainment, historic sights and shopping centres. TOP 10 RATED HOSTEL by Hostels.com! Recommended by famous Le Guide Michelin - Green Guides and Rick Steve's Guide! 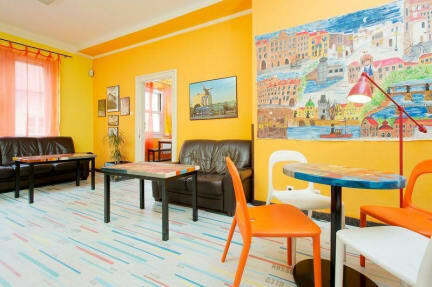 THE BEST LOCATED HOSTEL IN PRAGUE! At Old Town Square! From a club/ bar directly to the bed! No TAXI at night needed! - 1 min WALK from Náměstí Republiky/Municipal House - tram connection, the metro line B, airport shuttle transport + THE BIGGEST SHOPPING MALL PALLADIUM WITH OVER 200SHOPS AND 30RESTAURANTS! - 1 min WALK from the KOTVA Department Store. The best PUBCRAWL in Prague with our hostel!! Old Prague Hostel has negotiated a discounts to some of the MUST SEE places in Prague like Museum of Communism, Bohemian Bagel, Prague Tours AND MORE...so just save your money with us! - mini-supermarket - alcoholic and soft drinks, choice of beers, sandwiches, snacks, drugstore, souvenirs, postcards, public transport tickets, maps. Comfortable and clean beds, nice staff and good location! Om of the staff members were drunk. But in the other hand the other ones were so good. This hostel was located really good compared to the center and the train station. It was cosy and the staff was helpful and nice. Also you get breakfast! I liked this hostel. The room and bathroom were cleaned. The staff was friendly and the location of the hostel was good. It could get a bit noisy in this hostel but there were alot of bagpackers partying. I would recommend this place. Underbart hostel i alternativ stil. Väldigt ungdomligt. Läget är perfekt, mitt i Old Town och nära till allt. Rekommenderar verkligen detta hostel till ungdomar och personer som vill socialisera sig och festa.